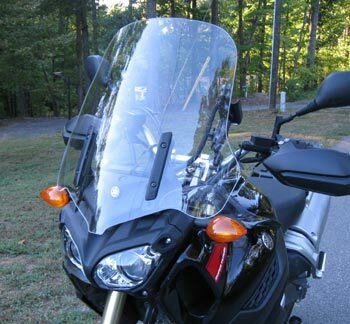 The Parabellum Replacement Windshield for the 2012-13 Yamaha Super Tenere uses advanced award winning design for a quiet ride and better gas mileage. It is made from 3/16 inch thick, cast military aircraft grade acrylic. 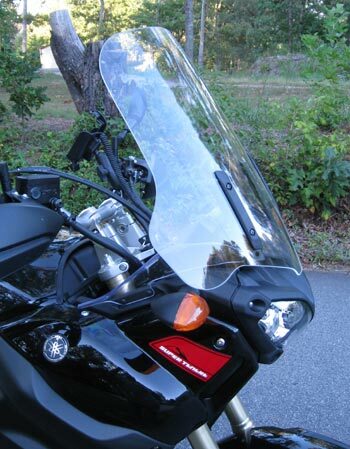 It is 3 inches wider than stock on each side at the top of the shield and is 2 inches wider than stock at the bottom of the shield and accommodates bar risers and the Yamaha wind deflectors. I wanted to let you know that in addition to reducing the noise and buffeting, your windscreen for my Super Tenere actually improved the mpg, which has jumped from 42 to 45. I was quite surprised, since it is considerably larger than either the stock or touring windscreen from Yamaha, both of which I have. I really didn't expect that bonus.